From Software's Shadow Die Twice Trailer | Nerd Much? Maybe it is a weapon in the future From Software game. The entire 30 seconds is watching some kind of device, like a pulley or a winch. It’s made mostly of metal with the spool of blood-soaked rope in the middle. On one side, clearly a part of the mechanic, is what appears to be either a bone or stone. In the background we see something else stuck into a wall (honestly, it looks like a screwdriver with a flat head). The wall is covered with parchment, unintelligible script written on it. Though we might be wrong about it being a wall, as the upper lefthand corner looks like the beginnings of a bush. The entire duration of this bloody scene, is something tightening the winch and what sounds like a weight being hung from it. 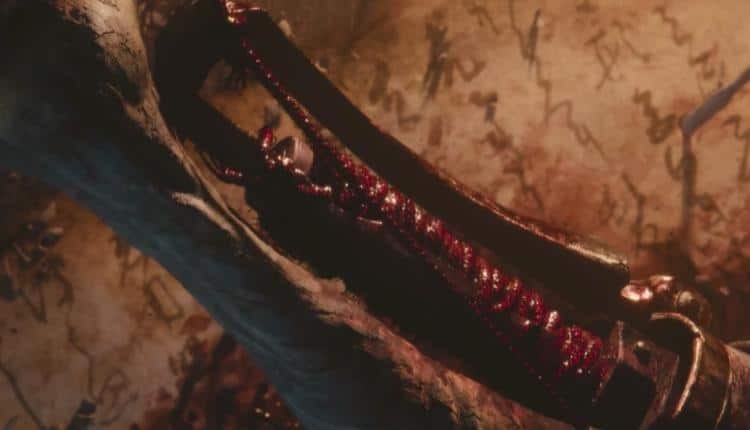 Who knows, maybe it is a weapon in the future From Software game. It would certainly explain the blood. Speculation has been running towards a new Bloodborne, though I have my money on a brand new IP. I feel if it was a new Bloodborne, they would come out and say so, but hype is also real. Ramping up the mystery before the announcement is a very important marketing technique, especially for those studios with a great game portfolio and quality trust from their consumers. As to what a new IP from the developers would look like, well, it’s clearly going to have dark themes, and violence will be an important part of the story. Whether or not that violence is very explicit (though it probably will be, we’ve all seen Dark Souls) it will be meaningful. Shadow Die Twice has no release date, nor platforms yet.